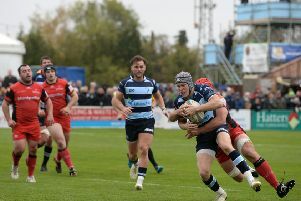 Bedford Blues have named a 25 man squad as they prepare to face near neighbours Northampton Saints under the lights at Goldington Road this evening. Following the demise of London Welsh, a gap in the Blues fixture list appeared but the void was soon filled by Jim Mallinder’s side who are still pushing hard for a play-off spot in the Aviva Premiership. The Saints last visited Goldington Road for a pre-season friendly in August 2013 when the visitors ran out 45-21 winners. This Friday’s encounter - which kicks off at 7.45pm - will be the perfect start to the weekend at Goldington Road which also includes the annual beer festival along with all the final Six Nations matches on the Saturday.